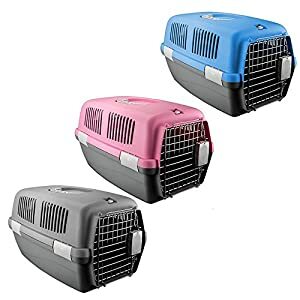 -6-IN-1 STURDY PET CARRIER: -BACKPACK PET CARRIER -FRONT PACK PET CARRIER -CAR SEAT CRATE -SHOULDER BAG PET CARRIER -2 POSITION CARRIER -SOFT-SIDED PET CARRIER BAG. Choose to carry your pet comfortably & easy on your back OR on your front with the top door open so you pet can follow where you go OR with the handles OR change to shoulder carrier in a snap -all straps are removable! 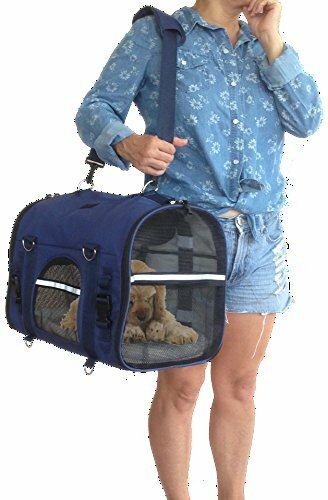 The carrier that will never collapse on your pet however you lift or carry it! -AIRLINE APPROVED -MORE SPACIOUS & HIGHER THAN MOST CARRIERS -CHEST STRAPS -SUPER STURDY. Extremely flexible and prepared to fit under almost any airline seats in a snap. 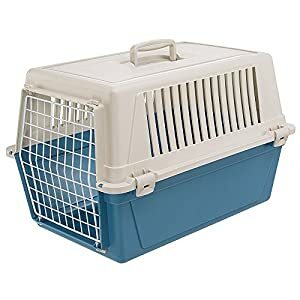 Fulfil all airlines rules that your pet must be able to stand up and turn around in the carrier. 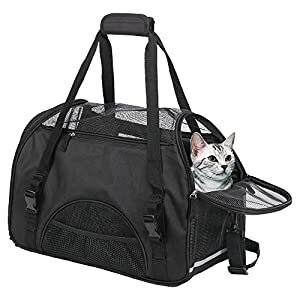 Patented flexible frames keeps the carrier completely unfolded and protects your pet from getting crushed when lifting it with the handles, onto your back, front or shoulder. -HIGH QUALITY DURABLE FABRIC -HIGH VENTILATION -WOODEN NON-BENDABLE STURDY FLOOR -ZIPPER SECURITY LOCKS -HAND WASHABLE FLEECE BED -SEATBELT LOOPS -EASY STORAGE -600 Denier Oxford water resistant fabric with reinforced zippers & locks. 4 High quality meshes to secure maximum air ventilation for your pet. The security locks prevent your pet from pushing the zippers open. Secure the carrier in the car with the seatbelt loops. Fold to about 2 inch for easy storage. LENGHT: Start at the nape of the neck (where the collar falls) and measure to the base of the tail. HEIGHT: Measure from the floor to the top of the shoulder. 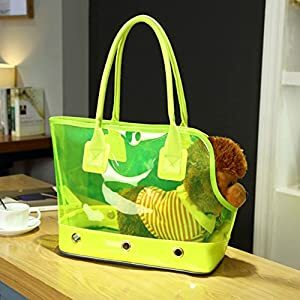 -6-IN-1 STURDY PET CARRIER: -BACKPACK PET CARRIER -FRONT PACK PET CARRIER -CAR SEAT CRATE -SHOULDER BAG PET CARRIER -2 POSITION CARRIER -SOFT-SIDED PET CARRIER BAG. Choose to carry your pet comfortably & easy on your back OR on your front with the top door open so you pet can follow where you go OR with the handles OR change to shoulder carrier in a snap -all straps are removable! 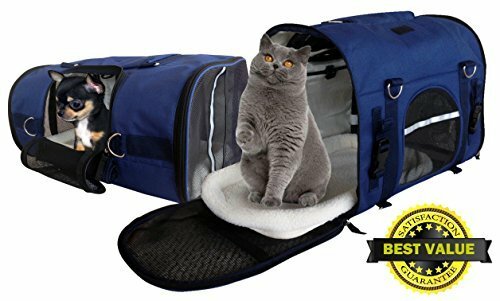 The carrier in order to never collapse on your pet then again you lift or carry it! -AIRLINE APPROVED -MORE SPACIOUS & HIGHER THAN MOST CARRIERS -CHEST STRAPS -SUPER STURDY. Extremely flexible and prepared to fit under almost any airline seats in a snap. Fulfil all airlines rules that your pet should be capable of rise up and turn around in the carrier. 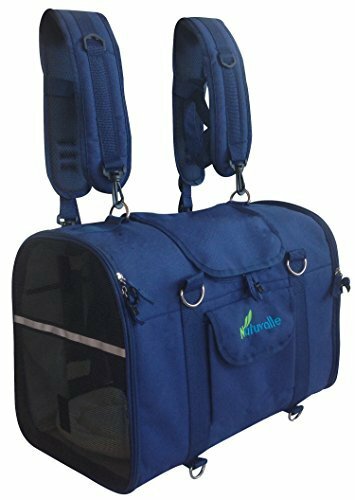 Patented flexible frames keeps the carrier completely unfolded and protects your pet from getting crushed when lifting it with the handles, onto your back, front or shoulder. -HIGH QUALITY DURABLE FABRIC -HIGH VENTILATION -WOODEN NON-BENDABLE STURDY FLOOR -ZIPPER SECURITY LOCKS -HAND WASHABLE FLEECE BED -SEATBELT LOOPS -EASY STORAGE -600 Denier Oxford water resistant fabric with reinforced zippers & locks. 4 Top quality meshes to Protected maximum air ventilation for your pet. The security locks prevent your pet from pushing the zippers open. Protected the carrier in the car with the seatbelt loops. Fold to about 2 inch for easy storage.